This is the next recipe in the 31 Days of Slow Cooker Meals series. I may or may not have a little tex-mex food problem. That was just in the last few weeks during all my conference travels. Two of those outings were a day apart from each other. It’s a problem. It’s also a problem taking 6 people out to dinner at a tex-mex place. Even though more than half are eating off the kid’s menu, it’s still MUY expensive. So…let’s bring tex-mex HOME. For less. This recipe made enough for my entire family to have with 2 meals. One meal as a side dish with fajitas, the other rolled up as bean (or bean and cheese) tacos. Paired with my Tex-Mex Restaurant Style Rice and you can feed your family for DAYS on this! Add all of the ingredients to the slow cooker and set on low for 8 hours. Once cooked, strain off some of the juices and add beans plus a little liquid to the stand mixer and mix on low for 2 minutes. Then mix on the second level for another 2 minutes, or until reach desired consistency. Add more liquid from the slow cooker if need be to reach desired consistency. 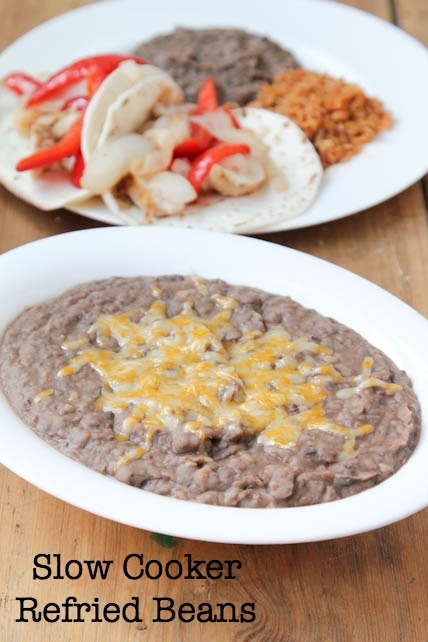 Serve refried beans as side dish for your favorite tex-mex food…or wrapped up with some cheese in a tortilla. Beans after they finished slow cooking. You can see there is quite a bit of liquid leftover. You will want to use some of that during the mashing process, but not all of that. We aren’t making bean soup. I used the stand mixer to mash the beans and it was lovely just standing there, watching it work it’s magic. 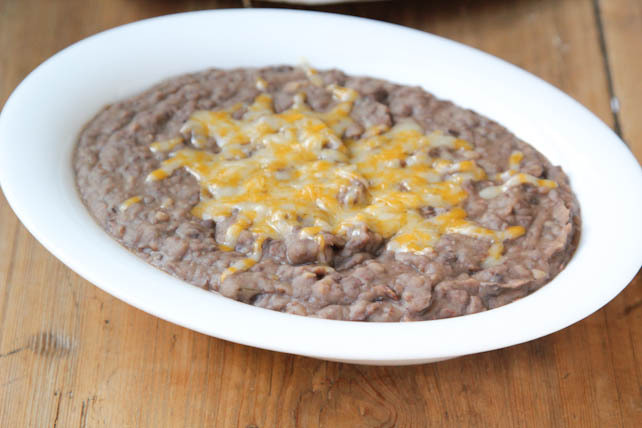 Yes, these are refried beans. They are ugly. And hard to photograph. But here they are. In all their delicious glory! 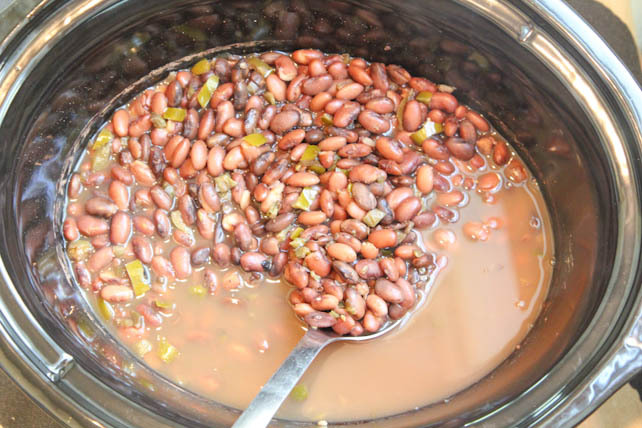 I love cooking beans in the crockpot, it’s so easy and they taste fantastic! Thanks for sharing your recipe! I make a similar recipe but add in a big spoon of than “Better Than Bouillon” & a quartered whole onion–comes out great! 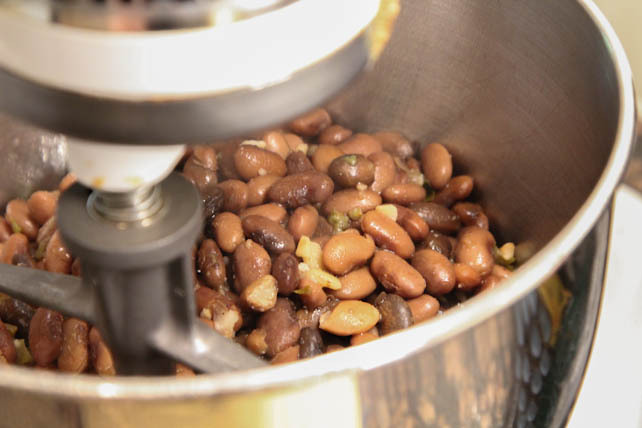 Do you use dried beans or canned beans? ok, so you don’t have to soak the beans? Would it work the same with black beans? I always add savory to soaking beans; and again when I cook them. It cuts down on the gas! Also, whenever the bubbles come to the surface, be sure to scrape them off for the same reason. Psssttt…I always add some bacon grease for great flavor! I know, it’s not low fat, but oh so yummy!!! 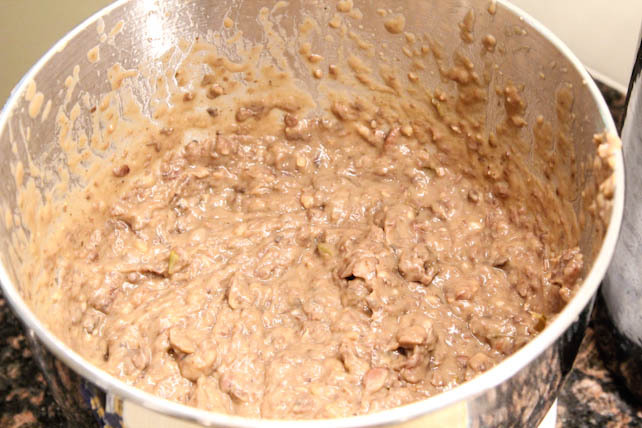 I can’t believe how easy it was to make such a huge quantity of refried beans (I did 2 lbs at once)! I immediately used some for enchiladas and then froze the rest in can size portions. And they are so healthy too!! !